There’s a fair bit of nonsense in the media about the dangers of plant-based diets in the hands of veggie parents and their vulnerable veggie children. Most of it is unfounded and not worth discussing; however, there are a few important points that do need to be taken into consideration if you are a parent raising a child on a plant-based diet – particularly if you would define it as a ‘vegan’ rather than ‘WFPB’ diet. I draw this distinction between vegan and WFPB because there is a greater risk of nutritional deficiencies and of eating a greater amount of less-than-ideal foods for people adhering to a vegan diet rather than for those who adhere to a WFPB diet. For instance, it’s perfectly possible to be a vegan while eating solely processed junk and never touching any whole fresh fruit and veg. This is simply impossible with a WFPB diet, of course. A December 2018 study 1 entitled “Vegan Nutrition for Mothers and Children: Practical Tools for Healthcare Providers” recognised that there’s a growing number of parents choosing vegan diets for their children 2 and, since most GP’s are quite clueless about nutrition (especially the plant-based variety), they wanted to give the best possible advice to medical practitioners so that they, in turn, can give more informed advice to their patients. Historically, the major reason why practitioners were worried about vegan diets was because the research 4 5 6 had looked at restricted rather than well-balanced and well-planned vegan diets. Any researcher would find deficiencies in vegan diets if the vegan diets they were looking at consisted of Walkers crisps and doughnuts! 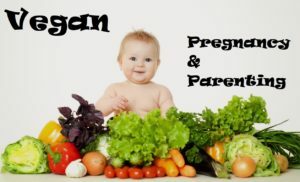 There’s plenty of support for well-planned vegan parenting from a wide range of scientific societies, ranging from the Academy of Nutrition and Dietetics and the American Academy of Pediatrics Commiteee on Nutrition to the European Society for Paediatric Gastroenterology, Hepatology, and Nutrition (ESPGHAN) Committee on Nutrition 9 10 11 12 . It’s been shown 13 14 15 that pregnant and breastfeeding vegan women have no problem in meeting all their nutrient needs on a vegan diet that includes a variety of plant foods and reliable sources of vitamin B12 and vitamin D.
Average birthweight of infants born to vegan mothers on well-planned diets does not differ significantly from that of infants of omnivorous mothers. An exception to this is where macrobiotic 16 vegan women, with diets highly restricted in calories and nutrients, do tend to give birth to infants whose weights are significantly lower than expected 17 . Research has shown 13 19 20 that the breast milk of vegan women who follow well-planned vegan diets provides adequate nutrition for their breastfed infants. Research has shown 21 22 that vegan preschoolers, children, and adolescents all fall within the normal growth ranges. The exception, again, is those who have followed restrictive macrobiotic diets, whose growth rates have been shown 23 to be reduced. Research has shown 24 that vegan children are less likely to become obese. Research has shown 25 that vegan children are less likely to be exposed to the worryingly high levels of antibiotics that are routinely fed to livestock eaten by omnivores in developed countries. Adipose tissue (commonly known as fat) is largely composed of adipokines 26 – these can be anti-inflammatory (a good thing) or pro-inflammatory (a bad thing). It’s been shown 27 that the adipokine profile of vegan children tends to be more favourable – that is, it tends to be anti-inflammatory. Previous blogs have already looked 28 at how diet affects inflammation within the body and how dangerous even mild, long-term (chronic) inflammation can be. Studies show that protein needs are easily met on a vegan diet. A previous blog 29 covered this subject in more detail. All amino acids, including those defined as ‘essential’, are found in plant proteins in pretty much the same proportions as in animal foods 30 . As we’ve already seen 31 , there’s no need to worry about trying to combine different protein sources at every meal. As mentioned above, there are periods when protein needs are particularly high (pregnancy, lactation, infancy and early childhood). During these times, there is a need to be aware that antinutritional factors (such as phytates) and fibre can reduce the digestibility of plant proteins 32 . However, it’s worth pointing out that “…there’s no real evidence of dietary protein deficiency...” and “…[p]eople are more likely to suffer from protein excess than protein deficiency.” 33 , and this would include babies, infants and older children in our society as well, so long as they eat enough food. Research has suggested 34 that protein intakes should be increased by 10% in vegan pregnant and lactating women, and also for all adult vegetarians. During the second and third trimester of pregnancy and during breastfeeding, it’s suggested 35 that mothers should consume additional servings of grains, protein-rich plant foods (legumes, soy milk, soy yoghurt, tofu, tempeh, and meat analogues 36 based on wheat or soy protein) and nuts and seeds. Breast or formula milk for 6 to 12 month olds is an ideal protein source in addition to gradually-introduced solid foods 37 . There have been some nutritional problems when vegan parents make up their own formulas, so it’s best to use only commercial infant formulas for vegan infants. There were some concerns about isoflavone 38 and aluminium in vegan formulas based on soy protein, but research now suggests 39 that modern soy formulas for infants are a safe option. From 1 to 17 years of age, a vegan diet can easily provide adequate protein, indeed, it’s quite possible to exceed protein requirements 40 . The small stomachs of infants and young children can’t contain great quantities of food, their total muscle mass is limited as is the efficiency of the amino acid pool 41 , thus they may benefit from eating a variety of plant sources of protein at each meal, or from consuming different plant protein sources at intervals shorter than every 6 hours – something that’s quite natural for them, as they tend to eat little and often 42 . There are two types of fibre: soluble and insoluble. Soluble fibre is fermented by gut bacteria (the microbiota) which, as we have seen in previous blogs 43 , produces highly beneficial compounds. Insoluble fibre has vital roles, including increasing the bulk of ingested food 44 . Additional effects of insoluble fibre are that it increases satiety (makes you feel ‘full’ quicker) and blocks the absorption of some of the protein and fat consumed, meaning you don’t absorb all the calories you put in your mouth – a great thing to maintain a healthy weight. However, as stated before, limiting food and calorie intake, which an excess of fibre will cause, may be detrimental during late pregnancy, infancy, and early childhood. Regular high fibre intake, as happens in healthy and balanced vegan diets, affects the gut microbiota richness of pregnant women positively 45 , thus helping to prevent constipation 46 . Although not so vital, fibre content should continue to be monitored since growth speed is still high 48 . Whole plant foods, with all their fibre, are now important for the toddler to reach an adequate diet for their nutritional needs. Research indicates 13 14 15 40 that there’s no problem at all with well-planned vegan diets satisfying omega-3 fatty acid requirements during pregnancy, lactation, infancy, and childhood. * Flaxseeds’ coatings are so tough that unless they are ground they will simply pass through the body. ** I personally advise against any oils (even the likes of olive oil) for reasons explained elsewhere in more detail 49 50 . A single serving of omega-3-rich foods provides around 2.5 g of alpha-linolenic acid (ALA), from which long chain polyunsaturated fatty acids (PUFAs) eicosapentaenoic/docosahexaenoic (EPA/DHA) are then synthesised 51 . In order to maintain optimal omega-6/omega-3 ratio and to favour conversion of ALA into PUFAs, seed oils rich in omega-6, trans fats (margarine), and tropical oils (coconut, palm, and palm kernel oils) rich in saturated fats should be avoided or strongly limited 52 53 . Diets of pregnant and lactating women should include 2 daily servings of omega-3 rich foods in order to meet requirements 15 . All pregnant or breastfeeding women, including vegans, should use a 100–200 mg DHA supplement daily 54 , with algal-derived DHA being shown 55 to be a viable alternative for vegan women. The breast milk of women following a well-balanced vegan diet (and appropriate formula milk) are a good source of omega-3 fatty acids 40 . Vegan children from 6 to 12 months should continue to receive breast milk or infant formula on demand and consume 1–2 servings daily of omega-3 rich foods, preferably in the form of flaxseed oil *, which does not contain fibre. * The jury is out on this one, for me. I suggest that further research is undertaken by parents concerned about whether or not proving ground flaxseed (dissolved in appropriate fluids) is not a better option than choosing an oil – which, as I have stated over and over again, is not a wholefood and has all the problems than any oil has in relation to endothelial cell damage, as outlined previously. 12 months onwards vegan children should have no difficulty in meeting their omega-3 requirements by consuming 2 servings of omega-3 rich foods each day 40 . DHA requirements are higher during infancy and early childhood, as DHA has been shown 56 to participate in retina and neural development. From 6 months to 3 years of age, it’s suggested 14 that all children, not only vegan children , should receive a daily DHA supplement of 100 mg and, again, an algal-derived DHA is shown 55 to be a viable option. Additionally, it’s only the absorption of the non-haem form of iron which is subject to homeostatic regulation. This has the effect of providing protection for plant-based eaters from iron overload, a risk factor for cardiometabolic diseases 60 . Phytates 61 are iron sequesters 62 . There’s a lot on nonsense in the media about the dangers of phytates – particularly their potential to reduce the bioavailability of calcium. If you need any reassurance about the how important phytates are in protecting us from cancer and other diseases (such as osteoporosis), as well as how they have been shown to do quite the reverse in terms of calcium absorption, Dr Michael Greger has produced a video 63 on this particular topic. Having said this, it’s important to ensure that dried beans are soaked for long enough (which removes lectins – another compound about which there’s a great deal of misinformation in the media 64 ) and that they, as well as dried whole grains, are cooked thoroughly. Sour leavening 65 , fermentation, and germination all increase non-haem iron bioavailability by reducing the concentration of phytates. If the foregoing has left you feeling a bit confused about the dietary advice regarding phytates and lectins, then it is a reflection of the confusion within much of the media and nutritional community. If you require more information, the references provided in this section should provide you with sufficient reassurance about just how important regular consumption of legumes (beans, peas, lentils) and whole grains are for maintaining optimal health. Since iron requirements almost double during pregnancy, it’s known 66 that all pregnant women are at potential risk of iron deficiency. Well-balanced vegan diets have been shown 13 to easily provide the average required increase in iron needs during pregnancy and lactation. In addition, these should ideally be in combination with a source of vitamin C (or other organic acids from fruit) or beta carotene 67 . Wheat germ and certain herbs (including dried thyme) have been shown 69 to have good good iron content when consumed in small volumes. Their regular consumption is encouraged for pregnant vegan women. During lactation there’s no requirement to take any supplements, since iron requirements drop significantly and iron intake should return to normal 15 . Since it’s been demonstrated 12 that all infants in our populations are at risk of iron deficiency, complementary solid foods rich in iron should form a central part of their diet. A source of vitamin C or other organic acids, such as lemon juice or fruit, should also be included with the above at every meal. It’s also suggested 40 that, in this age group, attention is payed to food preparation and cooking techniques that decrease the phytate content of the food. Another good source of zinc is nutritional yeast (which contains no phytates). We’ve looked previously 74 at this highly useful and tasty larder essential in relation to the prevention of breast cancer. Including vitamin C (or other organic acids found in fruits) along with zinc-rich foods in the same meal has been shown 75 to increase zinc absorption. Consuming a variety of plant foods rich in zinc (in combination with vitamin C or other organic acid sources) should be encouraged throughout the day. There was some concern 76 about zinc absorption being interfered with by iron; however, more recent research 77 doesn’t support this hypothesis and, thus, iron supplements can be prescribed to vegan pregnant women when haemoglobin levels drop below the levels outlined above, without the risk of compromising zinc status. From 6 to 12 months of age, breast milk and appropriate formula milk have been shown 7 to be good sources of zinc. Fibre content of children up to 24 months of age should be limited by choosing refined products or manually removing fibre (by peeling beans and straining fruits and vegetables) in order to increase zinc absorption 37 . In older children, daily consumption of a wide variety of plant foods is easily able to meet zinc requirements, with its absorption being enhanced by including vitamin C and organic acids sources (such as fruit for dessert and a few drops of lemon in the water) in a meal. Nutritional yeast can be spread over children’s meals (e.g., pasta, soups) as an additional source of zinc. As with many other minerals and vitamins, a deficiency in iodine (an element vital for normal thyroid function) is a worldwide problem, particularly for inland populations, with salt iodisation being a common measure used by governments. As discussed in previous blogs 78 , salt (whether iodised or not) can be a very serious danger to health. Good sources of iodine are of course, seafood (animals and plants) and, in coastal areas, iodine-containing water and mist from the sea 79 . The iodine content of a wide range of foods is discussed in more detail in an earlier blog 80 . The iodine content of various types of seaweed is sufficient for vegans. However, iodine content can vary to an astonishing degree and it’s just as dangerous to have too much iodine as too little, since either has been shown 82 to impair thyroid function in the foetus and even after birth. The recommended daily intake (at least in the USA) is 160 micrograms a day, but the World Health Organisation places the safe upper limit at 1,000 micrograms a day. For a five year old, for instance, 300 micrograms may even be too much, so there’s not a lot of room for error and careful attention should be paid to iodine levels. My personal recommendation is in line with that of Dr Greger’s – consume appropriate quantities of nori, dulse, alaria or wakame. These are each shown 83 to provide additional health benefits; while kelp (kombu), paddleweed, and hiziki (also known as hijki) should be avoided. There is an argument that, since vegans are known 88 to be less vulnerable to developing hypertension, maybe they shouldn’t worry too much about having a teaspoon or so of iodised salt each day. However, once again I stress that all salt intake should be reduced as much as possible and so an algal-derived supplement might be a much better option if regular small quantities of appropriate seaweeds are unacceptable for reasons of personal taste, price etc. If it is necessary to limit salt intake, an algal-derived supplement can be a viable option. Veg-1 89 from the Vegan Society is a vegan multivitamin which contains 150 μg of iodine. In no circumstances should salt of any sort be fed to infants under 12 months of age. 400 ml of breast milk (or 900 ml of formula milk) can alone meet iodine requirements 90 during the first year of life, so long as the mother is consuming the appropriate quantity of iodine in her own diet, of course. For children older than 12 months, an algal-based iodine source is recommended, although iodised salt is, if chosen, also a sufficient (and more reliably calculable) iodine source – be sure to check first the iodine content of any iodised salt available in your own country. There’s no issue about being able to reach calcium requirements in a well-balanced and varied vegan diet7 13 and, as pointed out in an earlier blog 91 , unlike the conventional ‘wisdom’, cow’s milk is not good for our bones and teeth: indeed, the opposite appears 92 to be the case. * Oxalates are another content of plants which has come under attack in the past – this time for being associated with kidney/gall stones. However, there’s a lot of evidence 93 94 that the opposite is actually the case, with animal protein and salt intake being largely responsible for kidney/gall stones. Additional research indicates 95 96 97 that it’s not just calcium intake that’s the only determinant of optimal bone mass density: as previously stated, sodium (salt) intake as well as phosphorus intake, exercise, and an optimal vitamin D and B12 status are also important in positively affecting bone mineralisation. Calcium from water has been shown 98 to have a high level of bioavailability. This means that tap water (which has an average calcium content of 100 mg/L) and calcium-rich mineral water (with an average calcium content of 300–350 mg/L) may be of use for vegans and non-vegans in meeting daily requirements. Calcium requirements increase during pregnancy, so it’s suggested 13 that six daily servings of calcium-rich foods are considered sufficient to satisfy calcium requirements in pregnant women. During lactation, calcium requirements reduce and so daily calcium needs would almost automatically be satisfied by consumption of a good variety of plant-based foods. Vegan infants are considered 37 to be able to meet most of their calcium requirements through breast milk or formula milk. Older vegan children, will reach their calcium requirements if 3 to 5 servings of calcium-rich foods per day are consumed 40 . Sun exposure and vitamin supplementation, rather than diet, are considered 99 to be the primary source of Vitamin D for vegans. If sun exposure is low, all subjects should 100 take some vitamin D supplements. Again, Veg-1 89 from the Vegan Society is a viable option since it contains 20µg (400% UK RDA) of vitamin D3 or cholecalciferol (extracted from lanolin – sheep’s wool) rather than vitamin D2 or ergocalciferol (plant-based). One research paper 101 mentioned in this study recommends either vitamin D2 or vitamin D3 at doses of 15-100µg as the most effective way of maintaining optimal vitamin D levels. It’s recommended 102 that Vitamin D status should be checked prior to conceiving, since vitamin D deficiency or insufficiency 103 in mothers may negatively affect their children’s health. The optimal serum 25-OH vitamin D levels 104 for pregnant women are considered 105 to be above 75 nmol/L (30 ng/mL). Pregnant women often take prenatal vitamins, the majority of which are considered 106 to contain insufficient vitamin D to prevent deficiency in the newborn baby. Therefore, a daily dose of 1000-2000 IU (25-50µg) is suggested 107 in order to ensure safe levels in pregnant women, with levels of 25-OH vitamin D (along with parathormone (PTH), calcium and phosphorus) needing to be checked after at least 6 months from the beginning of the supplementation. During pregnancy, supplementing more than 4000 IU (100µg) per day of vitamin D is regarded as unsafe. Thus, high dose boluses 108 , which normally contain upwards of 25,000 IU (625µg) of vitamin D must be avoided 109 . It’s important to note that human milk (and formula milk) is not sufficient to prevent vitamin D deficiency in infants 110 . As a result of this, it’s considered 106 of high importance that all infants, including vegan infants, should supplement 400 IU (10µg) of vitamin D each day during the first 12 months in order to prevent rickets and vitamin D deficiency later in life, with regular checks on calcium homeostasis continuing to be essential until serum 25-OH vitamin D, PTH, calcium, and phosphorus levels are normalised after initial supplementation. As we’ve already seen in previous blogs 111 112 , and elsewhere 3 , plant foods cannot provide a sufficient quantity of vitamin B12 (cyanocobalamin/methylcobalamin) – a vitamin made neither by plants nor animals but by microbes that cover the earth. Some vegan commentators consider that fermented food and seaweed are able to provide enough B12, but research suggests 113 that the latter are not reliable sources of this vital vitamin. Even relying on B12 fortified foods (plant milks/yogurts, soy products, etc) is questionable, since such products are not always easily available, and even when they are, it’s considered 7 that they have to be consumed 3 times a day in order to provide adequate amounts of vitamin B12. Thus, the suggestion of this study (along with my own and Dr Greger’s suggestion 114 ) is that all vegans meet their B12 requirements through B12 supplementation. Indeed, this does not only apply to vegans, since one recent study 115 showed that at least 40% of all people in the USA have B12 deficiency. During pregnancy, B12 stores can become depleted because of higher demand; thus, adequate B12 supplementation is vital during this time 116 19 . Breast milk from vegan mothers is able to provide the infant with sufficient vitamin B12 if and only if the mother is supplementing B12 correctly. Relying on pre-and postnatal multivitamins is not sufficient, even if they claim to contain 100% of vitamin B12 RDA. This is because only a fraction of the B12 provided will be absorbed. Therefore, pregnant and lactating vegan mothers should take individual B12 supplements and either dissolve them under the tongue or chew them slowly to increase their absorption 19 . Most studies recommend 117 that pregnant mothers start with high parenteral B12 doses (that is, administered elsewhere in the body rather than via the mouth or alimentary canal). Thereafter, oral B12 would be taken with the aim of providing 5 times the RDA. Because of its importance, vegan mothers would be expected to have their B12 levels (both optimal B12 level and serum B12 level) checked regularly and sufficient doses administered accordingly. This would be in addition to folic acid, homocysteine (HCY) and cell blood count (CBC) not before 6–8 months from the beginning of the B12 supplementation. At around 6 months of age, once complementary food begins to be introduced, vegan infants should start supplementing B12. By this stage, the content of B12 in both formula milk and breast milk decreases. There is no B12 deficiency protocol regarding supplementation for infants and children. This study recommends that oral supplementation is given at amounts of at least 5 times the RDA, depending on age and serum B12 levels. Further research is needed, of course, and vegan pregnant women need to ensure that they and their children are getting enough B12. However, there’s one thing to bear in mind here – there are no cases of B12 overdose on record. As Dr Greger points out 127 : “You cannot take too much B12 orally–your body will just pee out the excess.” So, to be on the safe side, just ensure that you and your children have more than the RDA every day. Dr Greger recommends 128 cyanocobalamin rather than methylcobalamin since the former is more easily absorbed. The study comments on the growth rate of children eating a well-planned vegan diet ibeing no different from children eating omnivore diets. However, it’s worth noting that there’s concern 130 about the increased risk of developing diseases and of dying younger if we grow more quickly during infancy and childhood. For instance, this has been documented in relation to girls’ increasingly early onset of menstruation and the subsequent risk of developing various diseases. I covered this is an earlier blog entitled ‘Mature Quickly and Die Sooner‘ 131 . Next Next post: Why Are Vegans Hated So Much?